A comparison of tea and coffee, on the grounds of caffeine content, health effects, cost, acidity, and other benefits. I admit my bias, as I'm a tea lover. On the question of tea vs coffee I am admittedly biased, as the creator of RateTea, and a die-hard tea enthusiast. But I acknowledge that the question of whether you prefer tea or coffee is a matter of personal taste. Tastes aside, there are more objective ways to compare tea and coffee, like by looking at the different ways in which coffee and tea affect the mind body. The biggest difference is in the caffeine content of these two drinks. But tea and coffee also vary in their acidity, health benefits, and cost, including their impact on the digestive tract. Most of these measures point towards tea being generally better for both body and budget. Is this black coffee or black tea pictured here? Read on and find out below. Although the content of each drink varies considerably, coffee tends to be consistently much higher in caffeine than tea. Caffeine, like many natural substances, can be temporarily beneficial to the mind and body in low concentrations, but harmful in too high a dose. A little caffeine can promote alertness and concentration, and provide energy or overcome tiredness, but too much can contribute to anxiety, insomnia, and other health problems, and a rebound or tolerance effect can create a caffeine crash as well as addiction. Extra caffeine can be good if you really need to wake up or stay alert! But it's not good to have lots of it all the time. The body quickly develops a tolerance and dependence (addiction) to caffeine. Caffeine addiction is usually mild and the worst part only takes a few days to overcome, but withdrawal symptoms can still be annoying and unpleasant, including headache, depression, and lethargy. Both tea and caffeine are widely variable in terms of caffeine content. However, coffee generally contains much more caffeine than tea, often 2-3 times as much. The caffeine content of tea is widely variable from one tea to the next, but tends to vary from 15-57mg in a typical 8 ounce cup, whereas coffee tends to have about 80-135mg. Modern espresso drinks, especially in larger sizes, can have much more. For this reason, tea is a better choice during pregnancy. It is a common myth that green tea or white tea contain less caffeine than black tea! You can't truthfully generalize about caffeine content by tea type. In particular, coffee is considerably harsher on the digestive system than tea. The main risk or downside of excessive coffee consumption is that coffee is known to irritate the digestive system, and can contribute to ulcers and to general upset and discomfort in the stomach and digestive tract. There are a few upsides and downsides to coffee, discussed on Dr. Andrew Weil's Is Coffee Good For You? Most, but not all, of coffee's health risks are due to its higher caffeine content. But the increased negative impact of coffee on the digestive system may be due both to its caffeine and acidity. Both coffee and tea are somewhat acidic, but coffee tends to be significantly more acidic (with a pH of 4.7-5) than tea (which is closer to 6). On RateTea I maintain an article on the acidity of tea relative to other substances. There are, however, other substances in coffee which may pose health risks. Heating natural substances to high temperatures can produced carcinogens, and there has been some concern that heavily roasted coffee may contain carcinogenic chemicals at unsafe levels. See health effects of coffee on Wikipedia for more information. Both coffee and tea are known to inhibit iron absorption, which can lead to iron deficiency anemia in some people. Ironically, in the case of tea, it is the antioxidants in tea that are binding to the iron, reinforcing that it is not always as simple as labelling a chemical substance as "good" or "bad". Gourmet coffee, per cup, usually costs significantly more than gourmet tea. Both coffee and tea have huge ranges of price. However, whether you're comparing a low-end, mass-produced product, or a typical high-end specialty coffee or tea, there is a clear trend that coffee is more expensive than tea on a per-cup basis. By the pound, coffee tends to fetch a lower price than tea, with many gourmet coffees ranging from $12-$18 a pound, whereas high-quality teas begin around $10 a pound and soar well into the triple-digits, with some teas easily fetching well over $100/pound. But the same amount of tea by weight yields four or more times as many cups as coffee. So, while a pound of tea will easily yield 160-200 cups of tea, a pound of coffee beans will only yield around 45 cups. Furthermore, the better teas tend to be able to be steeped multiple times, and factoring this in, tea starts looking even more attractive from a value perspective. Even high-quality coffee is usually only able to be steeped once. Both tea and coffee offer some modest benefits for health. Tea is a generally healthy beverage; science has begun to uncover evidence of a number of health benefits to tea; these benefits include a modest reduction of the risk of heart disease, a positive relationship between tea-drinking and bone density, and other benefits. Although green tea has gotten most of the attention about health benefits, the science generally supports the idea that black tea and other types of tea have roughly similar health benefits to green tea. If black tea tastes better to you, then drink that. Coffee also has some health benefits. There is some evidence that coffee may reduce the risk of certain diseases and chronic medical conditions, from Alzheimer's to type 2 diabetes. Tea has many, but not all of the same benefits as coffee. The health benefits of coffee are either not quite as numerous as tea, or perhaps have just not been studied as much. In case you're curious, the picture here is a cup of coffee; the picture at the top of the lens was a cup of black tea. 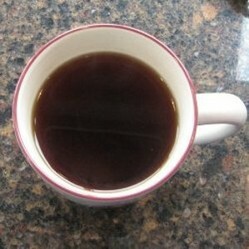 Black coffee tends to look a little darker / thicker than black tea. I had previously recommended WebMD, but have removed their site from this list because of concern about pro-pharmaceutical bias. I consider Mayo Clinic to be a much more accurate and independent source of information. Coffee and Health | Mayo Clinic - Q&A about coffee and health, from the Mayo Clinic. Mayo Clinic is my preferred source of medical info online; I think it is much more unbiased than WebMD, a site that is superficially similar. Tea | Linus Pauling Institute at Oregon State University - Linus Pauling Institute at Oregon State University; this is a massive meta-analysis of the literature on tea and health and is in my opinion the single most useful resource on the topic. Health Effects of Coffee | Wikipedia - Wikipedia article on the topic of health effects of coffee, both good and bad. A good starting point; make sure to check the sources cited though because anyone can edit this article. The amount of caffeine tea is highly variable; this page gives listings of some teas that tend to be naturally highest in caffeine. RateTea is a social and community website where anyone can rate and review teas. A comparison of Teavana vs. Adagio Teas, comparing price, value, quality, company ethics, and the relative strengths and weaknesses of both companies. I agree with Cazort on this subject. I drink gallons of tea, but must be careful with coffee. After my blood pressure rose I began to have headaches when I drunk strong coffee. I now only take coffee weak and rarely more than once a day. Signing of now as I head to the kitchen to make some more tea! Thanks! Yeah, the good news is that both coffee and tea have evidence that they're good for you. I think coffee just warrants a little more caution for some people because it has a lot more caffeine (like me--I'm pretty sensitive to caffeine). I'm good with a cup of coffee usually, but like, I couldn't handle drinking the volume of it that I drink of tea, which is often 3-5 cups a day. As a tea lover I appreciate all the positive points for tea here! I do enjoy my morning cup of coffee too though, so I'm glad it also has benefits. Not really a true tea, Yerba Mate is an infusion made from the yerba mate plant. Kombucha is a fermented tea that you can buy prepared, but why bother when you can make this tea brew with it's many health benefits at home? It's easy!